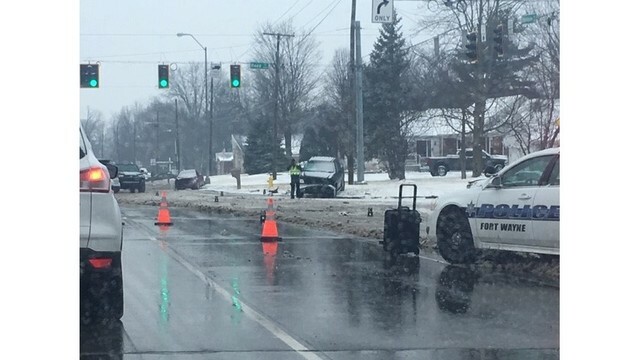 Fort Wayne Police investigate a crash at Stellhorn and Reed roads on Wednesday, Feb. 20, 2019. FORT WAYNE, Ind. (WANE) - A Fort Wayne woman critically hurt in a four-vehicle crash early Wednesday on Fort Wayne's northeast side has died. Police were called around 7 a.m. to the intersection of Stellhorn and Reed roads on several reports of a multi-vehicle crash there. Officers arrived to find four vehicles crashed. Inside one of the vehicles, authorities found a female driver with serious injuries. She was taken to a local hospital where doctors downgraded her condition to critical, police said. Fort Wayne Police said later that the victim had died. She was identified as 61-year-old Lana J. Schieferstein of Fort Wayne. The Allen County Coroner’s Office said Schieferstein died of blunt force injury due to a motor vehicle crash. Investigators believe the victim was trying to turn left, northbound, off of Stellhorn Road onto Reed Road when she turned into the path of a westbound SUV. The SUV struck the victim's vehicle, and two additional vehicles nearby were then struck. Roadways were snow covered and slick at the time of the crash, police said.